Do you know your corn farmer? Maybe you should. 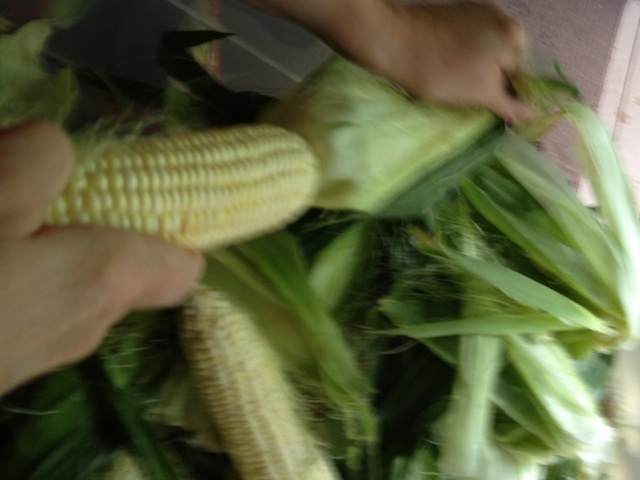 There's nothing sweeter than fresh Alabama corn. Typically there's a 10 day window (each year) that some big decisions must be made. Well, that is if you are best friends with your farmer. The best corn farmer in North Alabama, Jordan Hammer, called and shared that it was time. He had just harvested his corn field, and if we wanted in, we had to move quick. We arranged for our annual allotment of 12 dozen ears, met him just off the road in Killen, and made our annual transaction. My gosh, I think Jordan outdid himself this year. Possibly the best, sweetest corn ever. Linda spent several hours each night after work shucking and creaming. -- Not surprising that each night for dinner, just what we end up choosing for dinner. yup, corn is a big part of it, if not the complete meal. Monday night i gorged on nothing but four ears of corn. Last night friends joined in on the fun, in a celebration of "corn, corn, and corn", well, there was also a tamale in there that Estella made (which are also quite amazing). Corn may not be the best of summer, but it's gotta be in the top five. Just like almost all food choices, the best corn begins with our relationship with the farmer. Building a friendship and trust (as well as cook, chef, restaurant owner) with the farmer might just be the most important key to amazing southern food. Well, that's the way we (not always successfully) try to do it. One more little rule that's worked for us is when dining out, if the owner is usually in the kitchen, there's a dang good chance the food will be exceptional. We see this in the best restaurants in the country, as well as our local Chinese or Thai restaurant, or mexican taco trailer. Ah, one more that works for many, particularly when out of town, hungry and didn't do my restaurant home work - If there's a line get in it. Usually works. Sometimes presents some - unexpected surprises. I'm fortunate that some people feel the same way about their furniture maker. By the way, Jordan has a second crop of corn started, that should be available in October or so.